Our range of products include drainage mat, hdpe drainage cell, dimple sheet 500gsm, plastic drain cell, roof garden drain cell and 30mm drain cell. 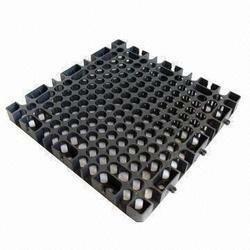 Dimple sheet of various gsm 400, 500 and 600 gsm is available with 8mm height, its a high-quality material with very competitive price, material is directly imported from italy and supply all over india. Our organization is counted amongst the most distinguished manufacturer, importers, distributors, traders and suppliers of Drain Cells. Our Designs and quality are as per international standard having high water flow and compressive strength.